The new Museum of Chinese in America holds its grand opening tonight. I think fondly of their new home designed by Maya Lin. Last Friday, the Stuck Elevator Workshop Reading was held in MoCA’s contemporary gallery space which features the Here and Now: Chinese Artists in New York exhibition. 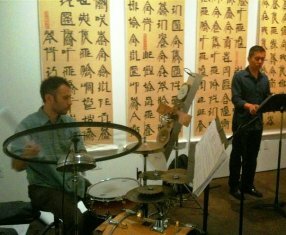 Stuck Elevator musicians rehearsed in front of Xu Bing’s work while construction workers hammered together shelves in the adjacent room and the alarm-system flashed lights and bells. During the rehearsal I kept repeating “It Could Be Worse,” one of the songs from the show, to myself. The Workshop Reading hosted by MoCA and the A/P/A Institute later that night was followed by a lively feedback session moderated by Jack Tchen. Musician/Scholar Cynthia Wang wrote insightful impressions of the reading on her blog. The week-long whirlwind of composing, rehearsing, and performing was fantastic thanks to a dedicated team. Aaron and I worked with director Tamilla Woodard, music director/cellist Alden Terry, performer Steven Eng, violinist Cynthia Marcus, and percussionist Paul Kikuchi. Helping with logistics were stage/production manager Edna Lee Figueroa, and numerous A/P/A Institute staff that included Laura Chen-Schultz, Alexandra Chang, and Ruby Gomez. A special thanks goes out to the MoCA staff who allowed us to have the Stuck Elevator reading a few days before the momentous opening tonight. MoCA’s Beatrice Chen and Cynthia Lee rock. Now, I’m back in Seattle picking pears, taking care of the chickens, weeding my vegetable patch, teaching at Cornish, composing for Whim W’him’s event this October, and thinking of the revisions for the November Stuck Elevator readings.